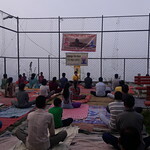 Vivekananda Kendra Kanyakumari Branch Shimla has celebrated International Day of Yoga to spread awareness of Yogabhyas, Regular Routine at two prime places of Shimla, Nabha Estate + Phagli area and Sector 3 of New Shimla. To make the celebration successful, a 10days Yoga Satra was arrange at RadhaKrishna Temple at Nabha area for the new aspirants. Celebration started at 6am at Tennis Court, with 3 aumkar & ShantiPath followed by a loosening exercises, Assan & Pranayam in line with the common protocol of the International Day of Yoga by the Ministry of Ayush. Samskar Varg Pramukh Shivam Riya & Kumari Varsha Rani helped the first timer to do practice without hesitation. Eminent persons like Dr. Ashwin from Department of Ayurveda of Himachal Pradesh, Nabha Corporate Shri ShashiShekharji, Phagli Corporate Shri Kalyanji, Shri KrishnaKumar Sharma (retd) AGM of State Bank of India, were partake in the Yogabhyas practice. Shri Hardikji, IT Sangathak of VRM&VK explains the basic of yoga, and important it in our daily routine and don't limit the yogabhyas just as exercise but get higher values by our culture and invited all to partake in daily Yoga Varga at Vivekananda Kendra at Nabha Estate. The celebration concluding with the SanthiMantra, total 41 persons participated in celebration. At New Shimla in association with Arogya Bharati Dr. Rakesh Pandit, Vivekananda Kendra celebrated International Day of Yoga at Garden of Sector-3. Vivekananda Kendra's Karyalaya Pramukh Shri Himmat Singh guided 30 participants with Loosening, Assam and Pranayam. By getting the enthusiasm of participants from age 8 to 70, the program is extend for more 2 days to teach SuryaNamaskars. In coming months the Yoga Satra & Aumkar Dhyan Satra is going to be conduct.